Like many successful internet stars, Jake Paul got his start on Vine making silly videos with friends and family. Jake soon scored mainstream success, eventually landing a role on Disney Channel's Bizaardvark. After 18 months of work on the show, Jake Paul has announced an abrupt mid-season departure from the network, a move which seems undoubtedly tied to his recent controversies. Jake made headlines this month after complaints from his neighbours hit the internet. Jake's neighbours allege that the internet sensation has made their lives "a living hell". Jake's "pranks" have angered his entire neighbourhood, leading them to consider a class action public nuisance lawsuit. 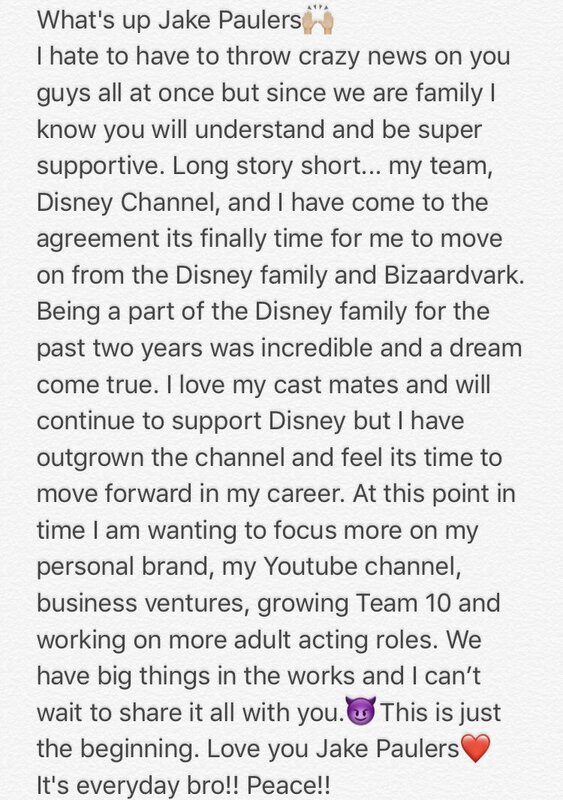 Over the weekend, a spokesperson for Disney announced that Jake would not be returning to Bizaardvark, calling the decision "mutual". "We’ve mutually agreed that Jake Paul will leave his role on the Disney Channel series Bizaardvark. On behalf of the production company, the cast, and crew, we thank Jake for his good work on the TV series for the past 18 months and extend our best wishes to him." Jake followed up Disney's statement with his own, confirming his departure. After being branded a "bad neighbour", it's easy to see why Disney would feel the need to distance itself. The network prides itself on making its stars "wholesome" role models for young viewers. Clearly, Jake's antics were too much for Disney to abide.